Home / Diapers / Best Diaper Pail 2018: Buyer’s Guide. If you think baby diapers are the end of your baby toiletry problems, then you probably haven’t been a parent for long. Disposing baby diapers can be a major issue especially when you live in the city and there really aren’t much disposable sites around. This is why I have created a list of best diaper pails in 2017. Using diaper pail helps with this problem and makes it easy to get rid of stinking diapers. Now that I have your attention on the need for a diaper pail for your kid, I imagine you’ve figured that every pregnant mother or nursing mother has to get one. 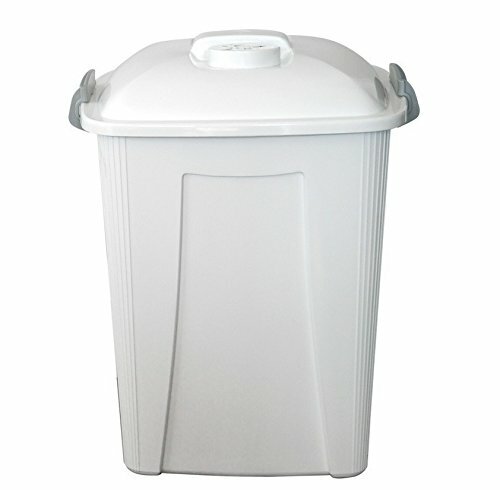 For your sake as well as the sake of the environment you live in, consider purchasing diaper pail for cleaner disposal of your baby’s diapers. That’s quite simple. I simply followed my advice, and I suggest that you do the same. The conditions that I have explained above will definitely point you in the right direction during your purchase and prevent you from having to return diaper pails or complain about its functionality when it riles you up. This stylish brand of baby diaper pails is an all-round favorite with its sleek design available in 13 different colors, giving your trash can a healthy look. It features a Powder coated steel container and airtight rubber seals to lock odors in. 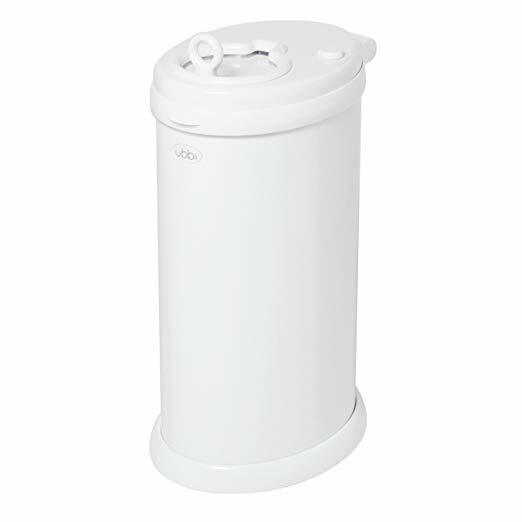 The Ubbi Steel Diaper Pail has been modified to meet the needs of today’s parents by offering essential convenience and value in utilizing any standard trash bag or reusable cloth liner. This feature makes it one of the easiest disposal system to load, use, empty and clean by offering a modern and sophisticated twist to a once very industrial product. The design of the bag holder is well improved and tough enough to avoid breakage and has been updated with a covered rim to avoid bag from ripping open. This improvement also involves a better insertion mechanism to avoid rubber gasket from falling. The childproof safety lock helps keeps your child’s business in check and help you avoid any awkward diaper situations you don’t want to deal with. The major con however, is that, the lid opener requires one free hand to open the slider on top as opposed to some other brands that use the foot lever for hands free opening. When it comes to kids, you need all the help you can get. The Munchkin Step diaper is an all-round awesome brand that makes diaper disposal simpler and does to your satisfaction. 4Apart from the regular features that you would find in other diaper pails, this brand also has a side door that opens, lets you change the gad or dispose off neatly without having to carry the pail. The top lid however, snaps shut without a chance of any diaper smell let out into your room’s atmosphere. This is made easy by sprinkling baking soda on in the pail each time you shut it to suppress the smell, providing you double security from the used diaper smell. Other features include the self-sealing system which doesn’t require you to manually shut the lid, but seals the bag shut as the lid closes. The Dual-refill compatibility has also been a major pro and attracted positive reviews to the product. The major complains from various users that have been interviewed have been in form of reports of their hands getting shut with the lid as it automatically closes while they release the diaper into it. Also, you would need to purchase the special pail liners and baking soda cartridges for as long as you use the diaper pail. In the long run, this makes the product a pricier option. The air tight system featured in most diaper pails is one of the most requested features in diaper pails. However, it’s not exactly the best option because no matter how sealed it is, the odor just keeps rushing up towards you as soon as you open it to dispose another diaper bag. 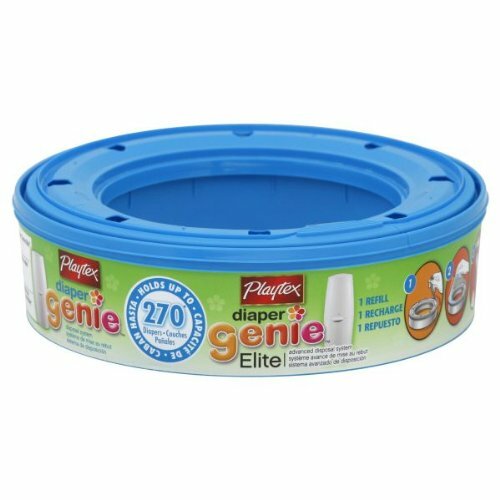 The distinct feature in the Diaper Genie disposal system takes care of this flaw with the special bags that are used to contain each disposed diaper in an airtight bag. It also features special push and lock clamping system and a 7-layer refill with barrier technology that seals in germs and prevents odor from escaping in case you decide to use your own disposable diaper bags. The easy to use one-hand design diaper pail holds up to 34 diapers while the starter refill holds up to 100 diapers. So, unless you’re running a baby pooing contest, you have nothing to worry about. As you deposit each diaper into this brand of pails, you would need to press the diaper down to have it compacted through a squeezing mechanism, so make sure that each diaper bag is sealed short to prevent even bigger problems for yourself. This may be a slight upgrade of the Munchkin step diaper pail I discussed earlier as it also features special diaper bags that help with complete odor and germs elimination. 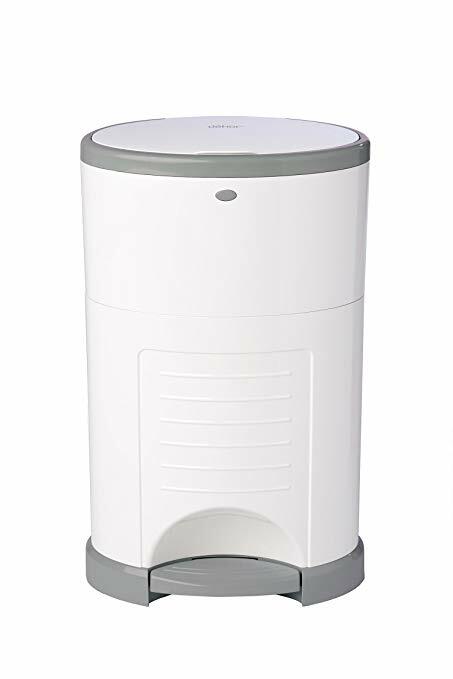 Speaking of germs and odor elimination, the dekor pus diaper pail is completely hands free with the foot lever that helps while you multitask. Unlike other flawed brands, you don’t have to add much pressure to the foot lever before it opens quickly, and basically no stress to have it sealed shut either. 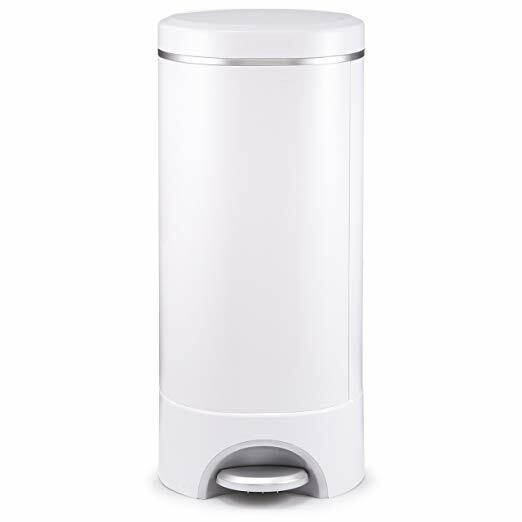 The Dekor plus diaper pail is made from ABS plastic which does not absorb odor like cheaper plastics leaving out the possibility of having to buy a new one after over time. The side door helps with easier disposal of the sorted bags and also has an air tight sealing mechanism like the lid on top. The handy lockout is hidden under the top over to keep curious toddlers out of access. However, installing the refill liners can come with a little complication so you should go through the instructions and probably watch video tutorials to get it right and save yourself from messy situations. This pail is designed specifically for cloth diapers just as the name implies. It features a capacity of seven gallons made from recycled plastic and has been known to be the only diaper pail that is specifically designed for cloth diapers. The fact that the product is focused on that kind of diapers makes it pretty special to the select part of the public that favor cloth diapers over other diaper bags. It also features a carbon filter that lets air in and keeps the odor from escaping, and held shut with the strong clamp enclosure. The teddy bear filter cage holds the carbon filter and screws together through a hole in the lid. The busch systems brand also features a citrus deodorizer disc alongside the carbon filter, giving you double protection from cloth diaper stink. The locking metal handles come in handy for to neutralize curious toddlers, pets or raccoons that like to steal dirty diapers and make a mess of your house. It has the capacity to hold about three days’ worth of dirty diapers on an average except you have triplets running on that one product. Like other brands, the major con is that it’s not a hands free kind of product as you literally have to unlock the clams on both sides of the lid. So multitasking on that might not be a possibility. Diaper pails are of different forms and have different specifications whose functionality are mostly dependent on your approach to cleaning your child up. These different modifications have been explained here to make your shopping experience easier and help you be a cleaner mom or guardian. Diaper pail or disposable paper? Just before you go about buying diaper pails for your baby, I want to explain this choice to you so that you can see how important it is. Waste disposal is not necessarily based on location, but mostly convenience centered. Using a disposable paper might contain it just right, but with the exception of containing the stench of baby stool. The ability of the disposable pail to be made with different specifications that handle different downsides of toilet waste disposal for your baby has made it rank better as an option over the disposable paper. Some of these options are the basics you need to consider when purchasing your diaper pail to make your choice worth well over disposable papers. This might not seem like an important option, but in cases where you have to dispose a full diaper pail with you baby in your hand, you will find this feature quite helpful. Also for parents and guardians who are partially germ phobic, like me, I’d prefer not to touch the diaper pail when or before I’m about to dispose off its contents. It just doesn’t sit right with me. However, having a handle that you could wrap in tissue or clothing and unveil when you’re about to dispose will do you good. This is just as important and by this I don’t just mean the lid on top, I also mean sealing it shut and preventing the odor from escaping the pail. That’s one other amazing feature you should look out for while purchasing diaper pails. Apart from odor control, opening the pail can also be a bummer at times, especially when you are multitasking. Experienced moms know this. However, having an opening system that doesn’t require too much effort is the way to go. Try diaper pails whose lids can be opened by placing your foot on the pedal below. I have always advised my audiences that the best version of every product contains just the right specifications you need and comes at an affordable price. The affordability of any product is one of the conditions that place it in the “best” category. If you will be purchasing your diaper pails on online, make sure you check our reviews of previous customers. That should drive you in the right direction. So far, in each products that I have reviewed, you would notice a distinct feature that I have expressly talked about that makes each product worthy your purchase. I’m sure that you would find one brand whose con you could afford to compromise on. Of all the reviews I’ve gotten, both online and from other users, I have found that you might not even notice the cons if you go easy on the product. You can install baby gates around the diaper pail area, thereby cutting them from access to it as well as from other toiletries.